Instructors–We are hiring! Positions available in California, Massachusetts and Minnesota! Due to the resources invested in training, and need for continuity in program delivery, candidates must be able to commit to teaching for at least one full school year. The full year may consist of either the fall and spring semesters of the same academic year, or spring of one year and fall of the following year. Science from Scientists (SfS) has an exciting job opening for a Development Officer in the Bedford, MA office. 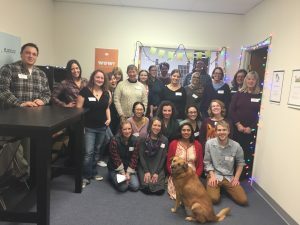 The Development Officer is a dynamic position with a primary focus in philanthropy, but with many opportunities for professional development in areas tangential to fundraising (e.g. business development, customer service, program management, program evaluation, governance relations, etc.) To learn more about this position, click here. 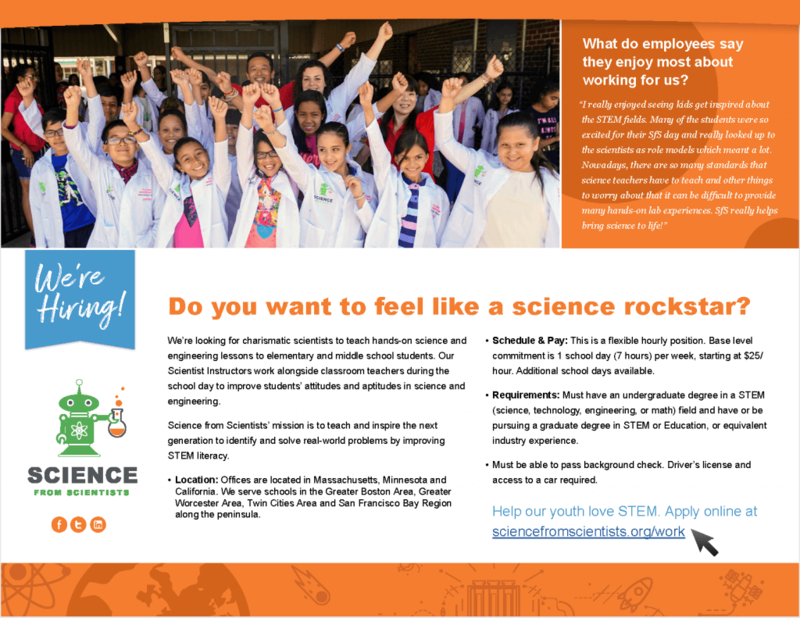 To apply, please send a cover letter, resume and 1-2 page writing sample (sample grant proposal, or sample related to development/marketing) to jobs@sciencefromscientists.org. Please include “MA Development Officer” in the subject line. Accepting applications until position is filled, with an immediate start date upon hire. If you are thinking about joining our team, learn more about the scientists that we hire. Read Marketa Melicharova’s story here. Read Catherine Sukow’s story here. Read Jenna Conversano’s story here. Read Karen Allendoerfer’s story here. Read Ben Hart’s story here.